Earth's history should include 'pre-plate tectonic' and 'plate tectonic' phases beginning less than a billion years ago, according to a team of geoscientists in the journal Geology. Earth formed about 4.6 billion years ago. As the surface cooled, it formed a crust over a molten magma interior. Geoscientists disagree over when plate tectonics began—specifically when the top layer of the crust, the lithosphere, began to slide over the underlying mantle. Estimates range from as early as a few tens of millions of years after the Earth formed, to as late as 750 million years ago. Part of the debate surrounds how to define plate tectonics. Geologist Tatsuki Tsujimori at Tohoku University and colleagues from Canada and the United States suggest 'true plate tectonics' began only 750 million years ago. They argue plate tectonics should be defined primarily by subduction: when a tectonic plate slides beneath another plate, steeply descending into the mantle below. 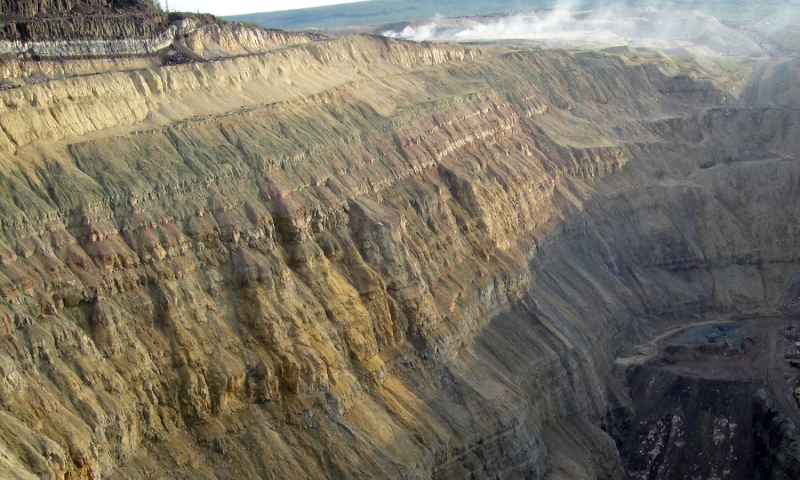 The steep angle is key because it takes water and carbon dioxide deep into the extremely hot mantle. Released water and carbon dioxide accumulate in the mantle, resulting in volatile pressure increases in the mantle, which are released by exploding through the lithosphere in a pipe. These explosion pipes are called kimberlites, and some contain diamonds. Kimberlites and related igneous rocks are formed only inside old continents such as South Africa, Siberia, and North America. 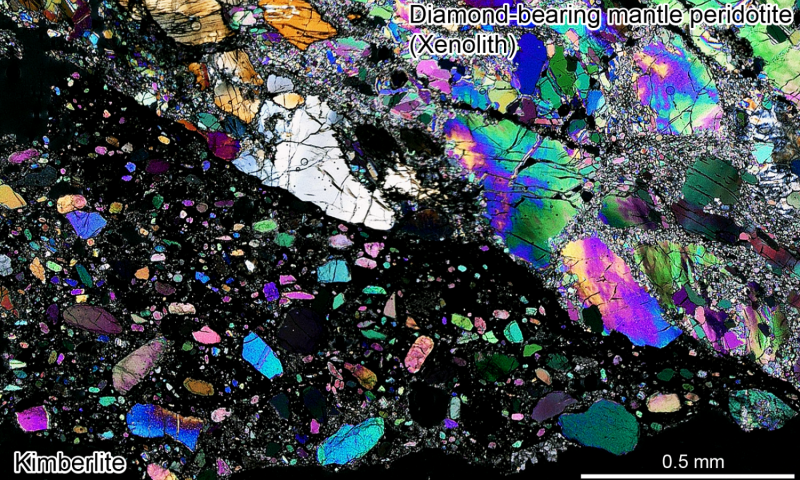 Most kimberlites found today are less than 1 billion years old, suggesting that the accumulation of water and carbon dioxide needed for this kind of eruption, and thus the modern style of subduction, began relatively recently. This paper stimulated a "Discussion and Reply" in the journal. In their reply, Tsujimori and his colleagues lay out their theory in a graphic that breaks up the Earth's history into five stages, the last of which is plate tectonics. 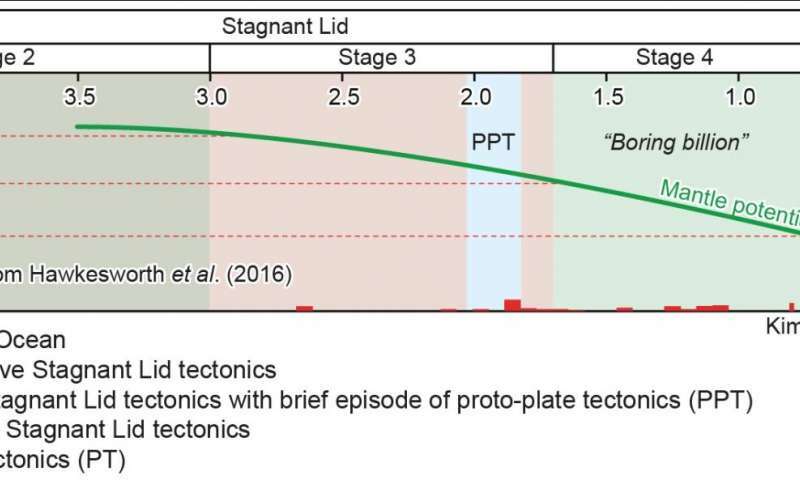 This timeline is different from those developed by many other geologists, who argue that plate tectonics encompasses not just deep subduction, but also shallow subduction and other styles of surface recycling that geoscientists call "stagnant lid tectonics". Stagnant lid tectonics is proposed for tectonically and magmatically vigorous planets like Venus that do not have plate tectonics. Such a tectonic regime likely occurred early on when Earth was still much hotter and the lithosphere was thinner, so plates were not dense enough to sink deep into the Earth or strong enough to hold together as a plate.